Allie and I lived in Boulder from Jan '97 through March '01, at which point we moved south to Arvada - a NW suburb of Denver as we couldn't afford to buy a single-family home in Boulder. Boulder was great for us, a fun adventure where we picked up and moved 1000 miles away from our family and friends. Sure we missed them all, but it was a great experience for us to explore a beautiful and new part of the U.S. together. Especially cool as we moved into an apartment sight-unseen and I started at a job with Schwinn Cycling and Fitness having never previously stepped foot in the building. 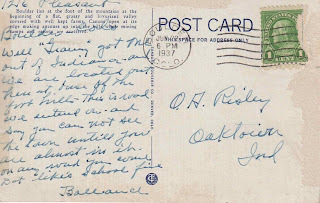 On to the postcard. 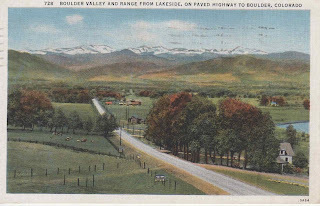 Titled "Boulder Valley and range from Lakeside, on paved highway to Boulder, Colorado"
I'm thinking this may be Arapahoe Ave. (Hwy. 7), east of Boulder. Anyone have a better guess? There are a number of small ponds on the north side of the road. printed copy: "Boulder lies at the foot of the mountains at the beginning of a flat, grassy and luxuriant valley covered with well kept farms. Canons open at its edge making avenues up in the hills where mining camps and resorts are scattered." Well "Granny" (?) got me out of Indiana and we are located here at base of foot hills. This is road we entered on. And say you can not see the town until you are almost in it. On any road you come. Dot like's (sic) school fine. Surprisingly it looks like 1216 Pleasant still stands as a house up on "the hill", likely a college rental. Marked with the orange and blue arrow below. Amazed that an errant couch fire hasn't taken it out sometime in the last 70 years. 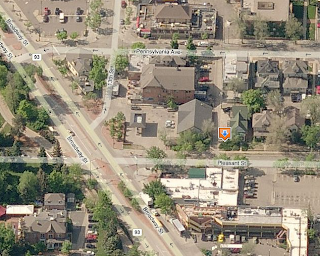 For reference for you Boulderites or one-time Boulderites, the venerable "The Sink" restaurant is shown top dead center in the photo. Mmm.. The Sink. Yeah, it's kind of a dumpy college bar and grill, but still fun. That and McGuckin Hardware (aka "McGuckins") are two of my favorite places in Boulder. 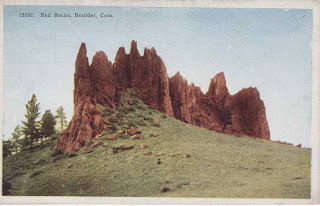 SPECIAL BONUS BOULDER POSTCARD - since you've scrolled down this far, here's my only other vintage Boulder postcard. Sadly it was never sent so there's no indication of the date. But it depicts a Boulder landmark in glorious "color", Red Rocks in the foothills. This is one of the places that Allie, Jupiter (our black lab) and I hiked up to within a week or so of moving to Boulder. We also watched the fireworks from this perch on July 4th, 1997. Good times. Given that it looks like it's heading directly toward Boulder Canyon, I would concur that it is likely Arapahoe. Although I thought Baseline might be another candidate. Lynn still wears her McGuckin's hat as her favorite ballcap.